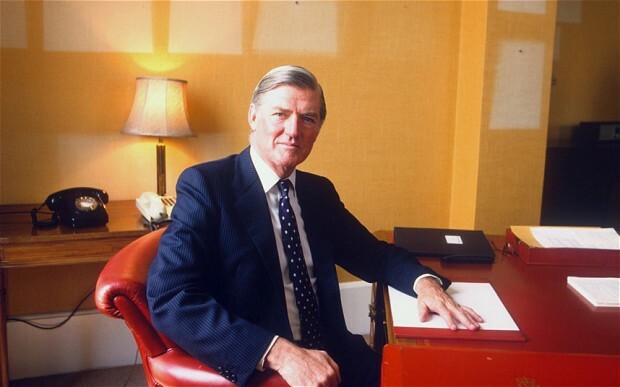 Most readers of this blog would have heard by now of the death of Cecil Parkinson, one of the big beasts of Thatcherite politics in the eighties. 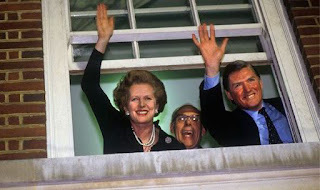 He was one of several ex-future-Prime Ministers; at times it seemed that anyone who was seen as a successor to Thatcher was cursed, in Parkinson's case by his inability to run his private affairs in some kind of a seemly fashion. In some ways his career is a modern morality play though, I think, the writer who could have done justice to him was not English but French: this son of a railway worker, grammar school boy, successful athlete and scholar at Cambridge, businessman, politician, probably the best Chairman of the Conservative Party in the late twentieth century, whose career was set back considerably by his behaviour towards his mistress and her child (and, ironically, the fact that he decided to stay with his wife) is really a fit subject of Balzac. What could be more fitting than a picture of him and the Prime Minister (by some accounts the only woman he was really loyal to) at the moment of his greatest triumph - the sweeping 1983 victory - when they both already knew that the storm clouds were gathering. The Telegraph, as you would expect, has produced a highly informative and objective obituary. There is a more personal memoir from Iain Dale who thinks that Parkinson remained a dissatisfied man, not having achieved what he really wanted and was capable of. Probably true but the fault lay not in his stars but in himself.